Since the beginning of the last century, dairy farmers in the Freisland region of Holland have kept Zwartbles Sheep, a strikingly handsome black sheep with a distinctive white blaze and 2 to 4 white "socks." Freisland lies in the North of Holland, and these beautiful and elegant sheep serve as dual purpose animals - meat and milk. 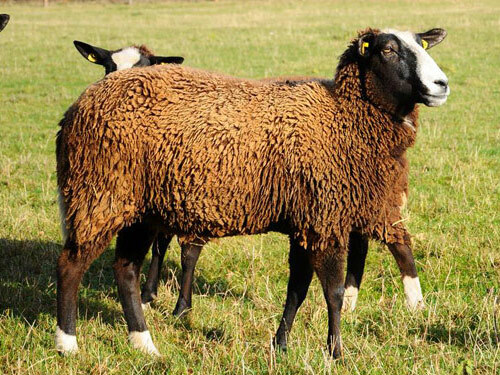 Due to changes in farming practices, numbers of Zwartbles in Holland became severely reduced until the breed was adopted by the Dutch Rare Breed Survival trust in the mid-1970s. In the last few years, a small number of Zwartbles sheep have been imported by enthusiasts to Great Britain. There are now 147 registered Zwartbles flocks (a total of about 3,500 sheep) spread throughout the UK, and they are well able to cope with the lowland and mid-altitude conditions in England, Wales, and Scotland.